Butter mix for the chicken. Mix together. Melt butter over low heat. Add onion, garlic, potatoes , carrot and celery. Cook for 5 mins. Add mushrooms, bread, salt, pepper, chilli flakes and herbs. Cook for 2 mins. Fill chicken with stuffings. Keep aside balance stuffing. Rub butter mixture all over the chicken. 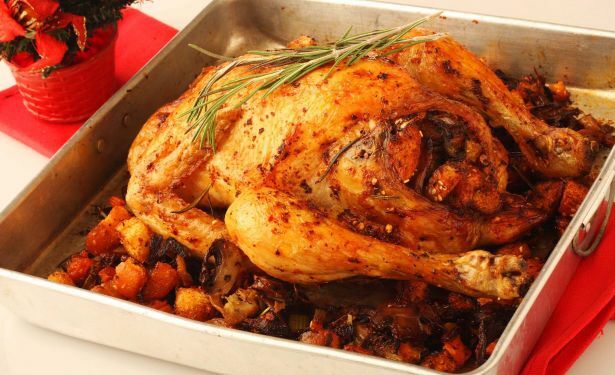 Place chicken and balance of the stuffing in a roasting tin. Cook for about 45 mins at 200 degrees Celcius. Baste chicken every 15mins. Note: To make sauce, place the roasting tin with roasted stuffing (balance) over medium heat, mix in 4 tbsp of flour and 500ml chicken stock. Cook for 7 mins. Then remove from fire. Tips: Once the chicken is cooked, remove from oven. Then cover with an aluminium foil for 15 mins to keep it moist .